Granta magazine has always known how to bring great stories – fiction and non-fiction, the one told through pictures and the ones told through poetry to life to its readers. They constantly strive to bring new writing to the reader and this is what keeps me going to read issue after issue of Granta. I distinctly remember when the Granta Pakistan issue came out and I was absolutely taken in by what it had to offer. 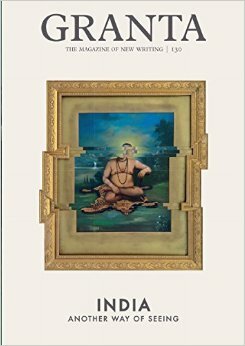 There was also another Granta on India and now in January 2015, they came out with Granta 130: India – Another Way of Seeing, edited by Ian Jack. I am absolutely floored by the pieces in this Granta. This issue takes on India in the new role that she is playing for the world to see, and at the same time quite ironically tackles matters that have been at the core to the country – poverty, homelessness, socio-economic divide, etc. The magazine has some fantastic and quite interesting pieces – right from Deepti Kapoor (author of A Bad Character) to Raghu Karnad, whose debut book will be out this year to Aman Sethi’s work, “Love Jihad” – the concept that was highly popularized in 2012 (one of my favourite pieces) to Katharine Boo’s pictures with Vijay Gadge, Devo Kadam, Sudip Sengupta and Unnati Tripathi, titled, “Annawadi” – a glimpse of what it took for her to write “Behind the Beautiful Forevers”. Granta 130 has all in all, 20 pieces for this edition and for me each one was better than the other. I loved the way the pieces are also set together. The writing depicts India like never before and also trying to break free from the perception that people have had of it for a very long time – the serpent rope dance impression is quite fading and very soon at that, which is much needed. My favourite pieces from this collection are: Drone by Hari Kunzru, Pyre by Amitava Kumar, The Ghost in the Kimono by Raghu Karnad (my most favourite piece), Breach Candy by Samanth Subramanian (maybe because I am from Bombay and it just felt like home was so close, though I am in Bangalore as of now), and Sticky Fingers by Arun Kolatkar. Granta 130 – India is an issue not to be missed out on. It will in all probability open your mind to the country that maybe we see with different lens and eyes. This entry was posted in Anthology, Books, Granta 130, Granta Magazine, Review and tagged 130, Another Way of Seeing, Anthology, art, Fiction, Granta, Ian Jack, India, Non-fiction, Poetry on February 1, 2015 by thehungryreader.